It might have some features that feel downright alien, but the Martian G2G smart watch looks, acts and feels almost like a regular timepiece. Unlike some smart watches, the Martian G2G's analogue clock face is always on-hand to tell the time. In fact, the only discernible difference to a regular watch is its small - and we mean truly tiny - OLED screen section, which measures a minuscule 96 x 16 pixels. It's monochrome, and home to scrolling alerts that let you know about incoming social media messages. The Martian G2G tethers to your Android or iOS smartphone over Bluetooth 4.0, a connection that we found easy to initiate but harder to hold than it should be. Still, what the watch does then is impressive. Fire up the free Martian Watch Alerts app and a plethora of features are available - and unusually comprehensive. There's everything from setting the vibration intensity and a Find Watch feature (as well as an anti-theft Leash feature that initiates an alarm if your watch wanders 10m beyond the phone) to alerts. These alerts come for direct messages on Facebook, Twitter mentions, reminders, events from Google Calendar and incoming emails. There's even a weather forecast option, which you can configure to show temperatures in either Celsius or Fahrenheit. What's really impressive about the Martian G2G, however, is its voice interaction. Having synced a phone's contacts, it's possible to wake up Siri or Google Now by pressing a button on the watch's left-hand side, and make a phone call in the regular way. In our test we managed to make a call completely hands-free, and just as importantly, in acceptable quality. We could hear our friend on the Martian G2G's tiny speaker under the screen, and they could hear us. Text message alerts on the Martian G2G's OLED screen worked, too, though it's like reading scrolling updates on the BBC News 24 channel. Patience is needed, and you don't always get the entire message. There's a useful Do Not Disturb feature that silences the Martian G2G at bedtime, but in practice we didn't always need this, since the Martian G2G didn't prove as reliable as we'd hoped. We didn't always get alerts on incoming emails, and we weren't always alerted to calendar events or Tweets. Whether this was because the Bluetooth connection kept dropping out or because of the app itself, we're not sure, but it's a significant problem if a scheduling gadget can't be trusted. Stylistically we can just about live with the Martian G2G, which is priced at US$249 (around £165 / AU$265). 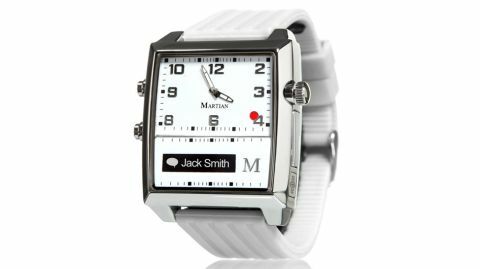 Its 39 x 37 x 13.3mm (1.53 x 1.46 x 0.52 inch) aluminium case weighs just 48g (1.7oz), and its clock face and silicone strap come in a variety of colours. Lasting a whole day in our test, the Martian G2G's rechargeable lithium battery charges via a micro USB cable, the port hidden on the watch's right-hand side under a rubber flap, though there's no onboard storage to transfer data or files. Best viewed as an accessory that extends the features of a smartphone, we're pretty sure that any attempt by Apple at an iWatch won't be unlike the Martian G2G. Martian has got it spot-on with a superb smartphone app, compatibility with both iOS and Android, hands-free voice calling, security features and enough social media alerts to keep anyone busy. The drawbacks are that it's primarily alerts-based, and to comfortably read a Facebook message, an email or the details of an appointment means fetching your smartphone from your pocket. Alerts, meanwhile, aren't as reliable as they need to be for the Martian G2G to be a huge success. It's lacking in polish, but this attempt at a smart watch is more intriguing than most.